This is a picture of Nara. There are four people in this picture: a man, a woman, a boy, and a girl. A man has a camera in his hands. He is wearing a hat. A woman has 鹿せんべいs in her hands, and she is wearing a shoulder bag. A girl is raising her hands. She is holding a 鹿せんべい in the left hand, and a hoop in her right hand. A boy is giving a 鹿せんべい to a deer. There is one deer behind his back. There are 14 deer in this picture. 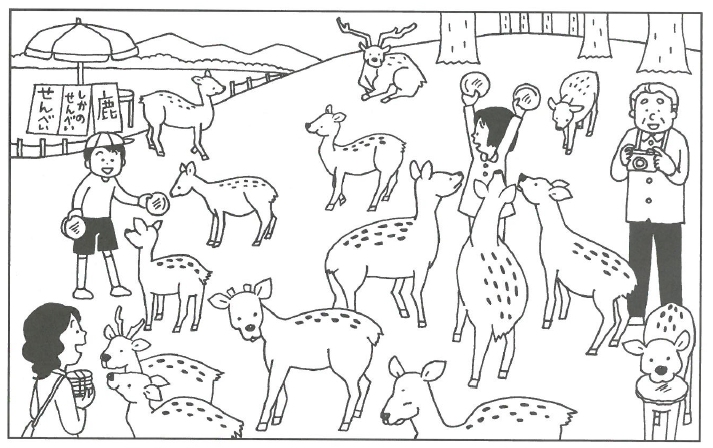 The deer in the bottom-right corner is eating a carrot. Another deer has a bell around his neck. There is a deer with long antlers. A deer has a unicorn horn. One deer in the center is eating something on the ground. There are also a squirrel and a dog in the picture. There is a Japanese parasol on the top left.